Psychology and Sports class 12 Notes Physical Education in PDF are available for free download in myCBSEguide mobile app. The best app for CBSE students now provides Psychology and Sports class 12 Notes Physical Education latest chapter wise notes for quick preparation of CBSE board exams and school-based annual examinations. Psychology and Sports class 12 Notes Physical Education on chapter 11 are also available for download in CBSE Guide website. CBSE guide notes are the comprehensive notes which covers the latest syllabus of CBSE and NCERT. It includes all the topics given in NCERT class 12 Physical Education textbook. Users can download CBSE guide quick revision notes from myCBSEguide mobile app and my CBSE guide website. Download CBSE class 12th revision notes for chapter 11 Psychology and Sports in PDF format for free. Download revision notes for Psychology and Sports class 12 Notes and score high in exams. These are the Psychology and Sports class 12 Notes Physical Education prepared by team of expert teachers. The revision notes help you revise the whole chapter 11 in minutes. Revision notes in exam days is one of the best tips recommended by teachers during exam days. Understanding stress, anxiety and its management. Personality, its dimensions and types; Rule of sports in personality. Motivation, its type and technique. The word psychology is derived from a Greek word ‘psyche’ and ‘logos’. ‘Psyche’ – soul or mind’ and ‘logos – study’. Generally it is accepted as study of behavior. Psychology is used in sport to enhance performance and to know the factors which affect our performance, like – anxiety, stress, personality, motivation, etc. Optimum level of anxiety is essential to perform in games and sports. Sports psychology and its importance in the field of sports. Sports psychology is the branch of applied psychology which deals with sports performance and the Behavior of a player during training or competitions. (i) Learning of Motor Skills Sports psychology plays a major role in the learning of motor skills. Motor skills learning depends on the individual’s level of readiness. background, heredity, growth, physical and mental maturity levels etc. (iii) Identifying Talent for Specific Sports Every sports has specific psychological demands. e. g boxing requires more aggressiveness, whereas archery and shooting require more concentration. (iv) Stabilizing the Performance for Longer Period It helps in stabilizing the performance of a player for a longer period. Then the performance of the player largely depends upon his psychological make up and anxiety level. (V) Important from Research Point of View Sports psychologists works in very close proximity to coaches to uplift the performance of players. Research findings help in promotion of sports and games. encourages the players, who, due to injury or some accident, are forced to take a long break from their professional career, to return to their sport. Stress and its management techniques. A state of affair involving demand on physical or mental energy. The body‘s physiological response to demands place on it. In simple words stress is a condition or circumstance which can disturb the normal physical and mental health of a person. Stress is nothing but response of body to an event or situation which are produced by physiological and psychological changes in the body stress is a body’s method to react a challenge. It is fight or flight reaction. Coping up is a technique which tells us now to handle anxiety or stress. Anxiety :- Anxiety is a psychological and physiological state of an individual. It is characterized by cognitive, emotional and behavioral components. These components combine to create an unpleasant feeling, which is associated with uneasiness, fear of worry. According to Levitt, ―Anxiety is a personal feeling of apprehension accompanied by an increased level of physiological arousals‖. Anxiety (also called angst or worry) is a psychological and physiological state characterized by somatic, emotional, cognitive, and behavioral components. It is the displeasing feeling of fear and concern. The root meaning of the word anxiety is ‘to vex or trouble’; in either presence or absence of psychological stress, anxiety can create feelings of fear, worry, uneasiness, and dread. Anxiety in sports is a natural reaction to threat in environment & part preparation of fight response. It is a psychological phenomenon. 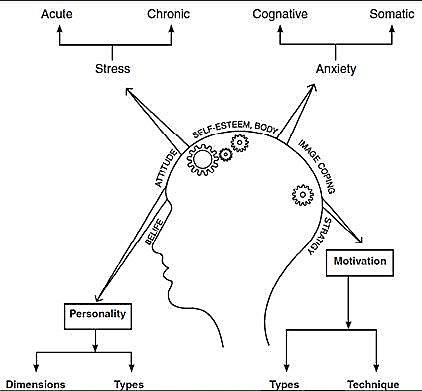 Personality is the dynamic organization within the individual of those psycho physical systems which determine his unique adjustment to his environment. Personality is not static but a dynamic concept. It is continuously chaning and growing. Children may have identical environment. They may have similar experiences but they react to the same environment in different way. Personality is a very important factor in games and sports as it influence the performance of individual by his/her level of cognition, motivation, traits and behavior. Types of Personality Introverts:- Introverts are shy, self conscious quit retiring interested in the own thoughts and feelings, inclined to worry and easily upset. Extroverts:- Extroverts are social, open frank, outgoing, eager to do thing adaptable, not easily worried or embarrassed and willing to work with others. Ambiverts:- In ambiverts both the characteristics of introverts and extroverts are found. In every person mostly both the characteristics are found through one of them may be predominant. Sports play a very important role in personality development. They improve the following qualities. (a) Self concept (b) Mental toughness (c) Emotional stability (d) Quick Decision (e) Planning (Points to be explained) Sports and games play an important role in the development of human personality. They are no less important than food and fresh water. Games and sports help to combat anxiety, depression and stress. Sports train sportsmen to accept defeat gracefully and to move on. Openness : persons wh like to lear new things, new concepts and enjoy new experiences usually remain on the top in openness. It inclues traits like being imaginative, insightful, and having a variety of interests. a) Conscientiousness: Persons who have a high degree of conscientiousness are reliable and prompt. Such persons remain organized, systematic, laborious and complete in all respects. b) Extroversion: Extroverts gets their energy from interacting with other individuals where as introverts get their energy from within themselves. Extroversion includes the traits of being energetic, talkative and assertive. c) Agreeableness: Such individuals are friendly, cooperative, compatible, kind and gentle. Persons with too agreeableness may be more distant or aloof. They are usually kind, generous, affectionate and sympathetic. d) Neuroticism: Neuroticism is also called emotional stability. This domain or dimension relates to one’s emotional stability and the degree of negative emotions. Persons who have high neuroticism usually experiences emotional instability and negative emotions. Such individuals remain moody and tense. Endomorph: Endomorphs have a pear shaped and a rounded physique. They have short arms and legs. The upper parts of arms and legs seem to be thicker than the lower parts. They have underdeveloped muscles. They are more inclined to become obese. Their excessive mass hinders their ability to compete in sports. These are most suitable for activities in which great strength is required. Mesomorph: Mesomorphs have a rectangular shaped body with athletic physiques and a balanced body composition. They are able to increase their muscles size quickly and easily. They have thick bones and muscles. Their chest and shoulders are broader than the waistline. They can excel in sports which require great strength, short bursts of energy and lots of power because they have enough strength, agility and speed. Ectomorphs: Ectomorphs are usually referred to as slim persons because their muscles and limbs are elongated. They have weak constitution of busy and face great difficulty in gaining weight. They have flat chest and have less muscle mass. They do not have a lot of strength but they dominate the endurance sports as their busy type is naturally suited to perform wonderfully in endurance sports. They are best suited for games and sports like gymnastics and long distance races. Motivation means to be inspired to do something. It is a kind of inner force which energizes a man to make constant efforts. According to Crook and Stein, “Motivation is any condition that might energies and directs our action.] Motivation energizes an individual to behave in particular way for attaining a specific goal. Intrinsic Motivation is within an individual and guides him/her to perform better. It is based upon needs, interest, nature, emotions, social need etc. It also depends upon knowledge of result, personal factor, competition zeal etc. He/she participates in sports for his/her own sake. (ì) Healthy Sports Environment A healthy sports environment plays a vital role in motivating the sportsperson. Healthy sport environment consists of proper humidity and temperature, smooth and clean sports fields, good quality of sports equipment and other facilities. Positive Attitude For proper motivation, the coaches should try to encourage positive attitude among sportspersons. Players must think positively. (ìì) Cash Prizes, Certificates and Trophies These are good incentives to sportspersons. Governments offer cash prizes to sportspersons who win. Body image is how and what you think and feel about your body. i) Media Images:- During teenage, the teenagers become more aware of celebrities and media images. They usually start to compare themselves with media images and celebrities. ii) Family and school:- We do not develop our body image all on our own. The family, school and other members of society can influence our self-esteem and body image. iii) Life experience and natural ageing process: Body image and self-esteem are also significant factors which influence the body image influence our body image and self-esteem. Hostile aggression: Hostile aggression is inflicting or causing harm whether it is physical or psychological on someone else. It is sometimes referred as reactive aggression and can be accompanied by anger. In hostile aggression, the main aim is to cause injury to another person. The intention is on causing pain and suffering. Instrumental aggression: Instrumental aggression is displaying aggressive behavior in pursuit of a non-aggressive goal. It is also known as channeled aggression is not accompanied by anger. Instrumental aggression is behavior that has intent to hurt in order to achieve money, praise or victory. Assertive behavior: Assertive behavior is different type of aggression/aggressive behavior. This is defined as behavior that involves the use of legitimate physical or verbal force to achieve one’s purpose. In Assertive behavior, the intention is to establish dominance rather than to harm the opponent. Psychology and Sports class 12 Notes Physical Education. CBSE quick revision note for class-12 Physical Education, Chemistry, Math’s, Biology and other subject are very helpful to revise the whole syllabus during exam days. The revision notes covers all important formulas and concepts given in the chapter. Even if you wish to have an overview of a chapter, quick revision notes are here to do if for you. These notes will certainly save your time during stressful exam days. To download Psychology and Sports class 12 Notes Physical Education, sample paper for class 12 Physics, Chemistry, Biology, History, Political Science, Economics, Geography, Computer Science, Home Science, Accountancy, Business Studies, and Home Science; do check myCBSEguide app or website. myCBSEguide provides sample papers with solution, test papers for chapter-wise practice, NCERT solutions, NCERT Exemplar solutions, quick revision notes for ready reference, CBSE guess papers and CBSE important question papers. Sample Paper all are made available through the best app for CBSE students and myCBSEguide website.